DOCTOR WHO: Companion Pieces - JO GRANT | Warped Factor - Words in the Key of Geek. In this weeks Companion Pieces column Tony Fyler shares an appreciation of Jo Grant. Right from the beginning of Doctor Who, there have been two main traditions in the role of the companion: the unquestioningly loyal, and the challenging. Susan was unquestioningly loyal (most of the time), while Ian and Barbara were initially, and for much of their time, the voice of challenge and question. Vicki was loyal, Steven more questioning. Even into the 70s and 80s, Sarah-Jane was fittingly full of questions, Leela full of more child-like fierce loyalty. Tegan and Adric challenged and tantrummed, Nyssa was the balancing calm loyal one, and so on. While no-one would dare call either Rose Tyler, Amy Pond or Clara Oswald exactly passive, add the men in their lives to the equation, and it’s easy to see the divide between loyalty and challenge – with Mickey, Rory and Danny being very much modern Chestertons in their ‘Now, just hold on a minute’ stances that showed the lives of the Doctor and his primary companions in a different, more honest, less intoxicated light. The story of Jo Grant is very much the story of a conscious decision by showrunners to steer away from challenge and back to loyalty of the Susan, or more like the Jamie kind – brave, frequently out of their depth, but always absolutely sure the Doctor was a good man, and ready to die to protect him should the need arise. Caroline John had helped Doctor Who launch itself in a very different mould with Jon Pertwee’s Doctor – the Earthbound, military setting had needed as much anchoring as possible to allow Pertwee’s mischievous alien action man to fully flower on-screen. But it became apparent reasonably quickly that Liz was almost too good for the role she was allotted – she was academically clever, but also a switched-on 70s woman, not prepared to be bamboozled either by the Doctor’s alien flim-flam or by the Brigadier’s military bombast. Increasingly, while Caroline gave the role absolutely everything it demanded, it became apparent that it wasn’t able to demand very much – the role in the early 70s was to look pretty, scream on cue, get captured and in the meantime, hand the Doctor his test-tubes. Both Caroline John and Liz Shaw were too good to sit about doing that. 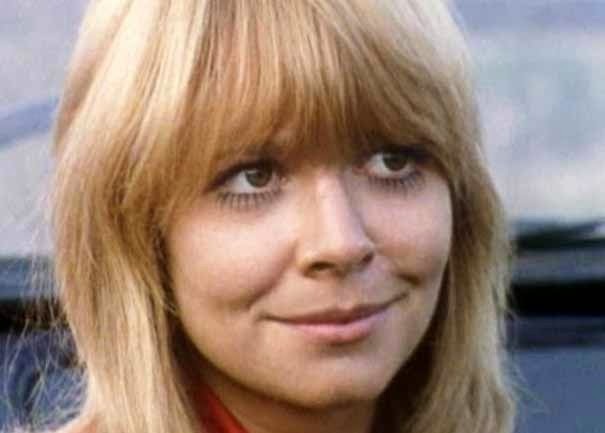 So in a conscious decision to uncomplicate the companion, tiny, clumsy, squeaky and largely clueless Jo Grant was brought in, played by the unique force of nature that was and is Katy Manning. Almost as though trying to re-begin the Pertwee era, she was introduced in a story with the Nestene consciousness and the Autons – just as Pertwee’s Doctor and Liz Shaw had been a year before. 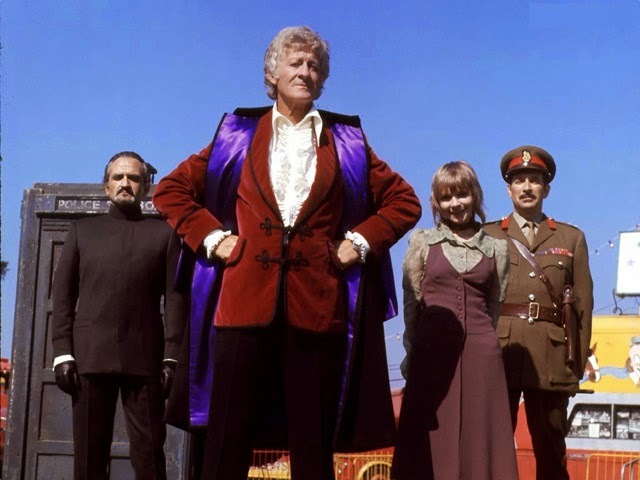 But crucially, the Production Team had had the brainwave that would define Pertwee’s era (and a character duality) for the rest of its time – giving the Doctor his humanoid arch-nemesis in the form of the Master. The comparison is often made between Pertwee’s Doctor and Sherlock Holmes, Delgado’s Master and Professor Moriarty. What is usually less clear is that for the idea to lock into place, Sherlock needs both his Watson and his Lestrade. With the Brigadier and his gang doing a bang-up job as Lestrade and the police, what was necessary was a companion who could be the Doctor’s Watson – loyal, unquestioning, not by any means stupid, but led always more by the heart than the head, into danger, into fear, and if necessary even into death. That’s Jo Grant, girl adventurer – she’s the Doctor’s Watson. Launching into her assigned role as his assistant, Jo takes the Doctor’s initial unfriendliness in good humour, having come relatively fresh from spy school and having pulled a familial string or two, knowing she’ll face challenging situations and people. This is something of a signature characteristic for Jo – she accepts the weirdness of the Doctor’s life, accepts the madness of the concepts that underpin it, with relative ease – she’s here to stop bad people doing bad things, and whether they’re alien, like the Master and the Nestenes, or more Earth-original, like BOSS and the giant maggots, she squares her shoulders, points her elfin chin and sets her heart to it. No-one would ever describe Jo as particularly bright, nor indeed as a particularly strong role model for women, but Jo’s strength is emotional, rather than physical, conciliatory rather than confrontational, in that she instinctively understands both herself, and her concepts of good and evil. There are relatively few grey areas in her concept of morality. Doctor – good. Earth – good. Josephine Grant – good. Anyone who threatens any of those things is therefore bad, and with a morality this unclouded, in goes Jo with the heart of a lion. A scared lion, certainly, a lion that finds itself out of its natural environment – but never, ever a cowardly one. While it would be easy to dismiss Jo as the ‘archetypal screaming girl,’ that would be a colossal mistake. Seeing Jo in her moments without the Doctor gives the lie to this idea. Look at her on Peladon, inspiring the planet’s king to be stronger in the pursuit of his future. Look at her in Colony In Space, imprisoned by the Master and not afraid to talk to him. Look at her particularly in Planet of the Daleks – the Doctor’s unconscious, the Tardis useless, and there’s Jo – making detailed notes on everything around her in case they should be found and prove useful, keeping her head within the bounds of her situation. She’s never going to be the smartest cookie in the biscuit tin, but Jo Grant has a kind of inner strength you can see at school gates around the country, around the world. 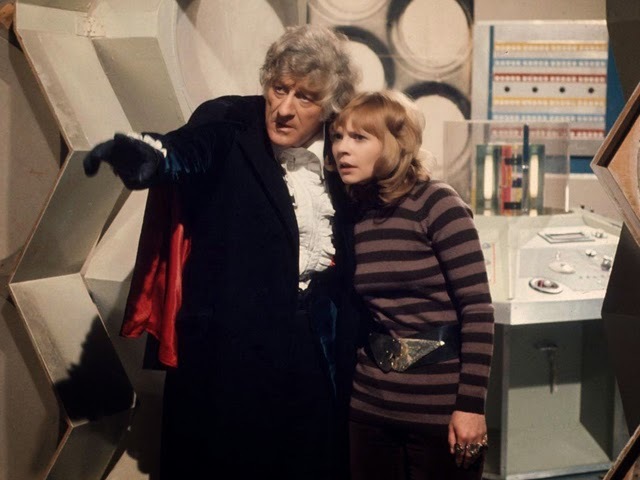 Perversely, for a character almost custom-built to give Pertwee’s Doctor someone to play father to, it turns out that Jo Grant has essentially the kind of courage that marks out a very particular kind of woman: Jo Grant has the courage, the cunning and the fiery protective instincts of an everymother. 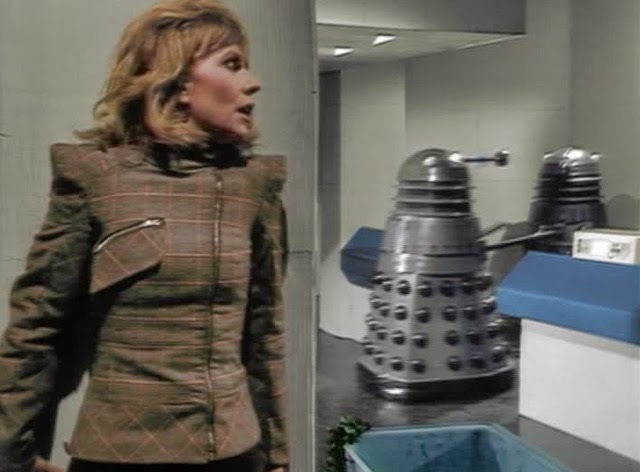 Perhaps the most defining scene for her character underlines this argument perfectly: when faced with Azal, the Daemon who towers above all humans and threatens to kill the Doctor, Jo Grant – little, blonde, squeaky Jo Grant, steps in front of the middle-aged Time Lord and screams ‘Take me! Take my life, not his!’ The Doctor’s ‘daughter’-figure has become well and truly his mum, fighting his battles, defending him against his detractors, and willing to suffer herself so that he doesn’t have to. Every companion ultimately leaves the Doctor – either by dying, or going off, or in some cases because he tells them to. There has seldom been a more ‘right’ leaving of the Doctor than Jo’s. While no-one will ever take the place of the beaky-nosed Time Lord in her heart, Jo finds herself another distracted scientist, but one who’s her age, with (almost) her hairstyle, and with a passion for adventure and exploration that matches her own. 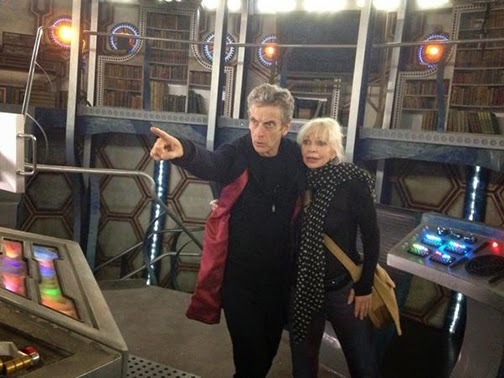 She’s explored parts of the universe that Cliff Jones will never reach, but she’s led, as ever by her heart, to go where he goes, to gently turn the mothering instinct into something more equalised than it could ever be with the Doctor – the instinct for partnership, for a journey and a passion shared. She’s found a new way to save the world, and the Doctor, having helped her find herself and been saved many times by her courage, her bravery and her unquestioning loyalty to him and to what’s right, lets her go, showing the kind of personal bravery that he did when locking Susan out of the Tardis, taking the pain of the ending of their time together as stoically as he must, and as courageously as Jo Grant has taught him to. Beyond her time in Classic Who of course, Jo lives on in the Big Finish audio range, and gloriously came back in The Sarah-Jane Adventures. For the essence of Jo, listen to The Many Deaths of Jo Grant – it shows how much and how willing she is to suffer, and if need-be die, for her Doctor. And despite several novels claiming she led a life studded with unhappiness after leaving the Doctor with Cliff, it’s a credit to Russell T Davies’s understanding of the fundamental core of her nature that when she came back in The Sarah-Jane Adventures, she’s still married to Cliff, has children and a grandson, and is still travelling the Earth, fighting the good fight. She’s always ready to become the Doctor’s Watson again should the need arise, but now she’s been fulfilled by the way her life has played out. She’s stopped being the Doctor’s mum, and become what she was always likely to become – Jo Grant, girl adventurer has become Jo Jones, Earth Mother, protecting the world and protecting her brood through the strength of her ever-giving heart.